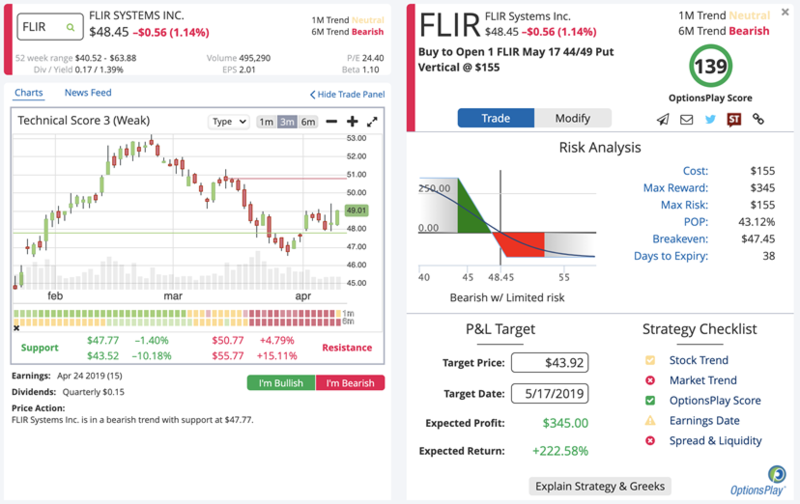 The bearish DailyPlay we chose for Wednesday, April 10th is Flir Systems (FLIR). FLIR is part of the Technology Sector (XLK). XLK has rallied 9.17% higher over the past month and its 1m and 6m trend turned bullish on March 11th but has reached a double top and overbought levels. Flir System’s 1m and 6m trends turned bearish on March 19th while breaking below its $49 support level, which now becomes resistance. With a technical score of 3 (out of 10), FLIR is a weak stock that will likely continue lower. As a stop loss, if FLIR was to trade above $49 for multiple days, this would invalidate our analysis and suggest getting out of the trade. Wealth365 Summit: Top 3 Strategies for Generating Income w/ Weekly Options – Thurs 4/11 @ 9:00AM EST Register Now! TradePMR Adds OptionsPlay® Ideas to RIA Platform.